Doraemon: Nobita and the Birth of Japan (ドラえもん: のび太の日本誕生 Doraemon: Nobita no Nihon Tanjō?) is the tenth Doraemon film, which was released in 1989. Story:The movie starts with a boy belongs to prehistoric time hunting a fish, got captured in to time vortex and reaches to the 20th century. In the 20th century, Nobita wants to run away from his home, as depicted many times in various episodes. As a result of failing to find an ideal home, Nobita decides to make a makeshift place to live. However, he still cannot find a place to live due to land property ownership laws. At the same time, Shizuka, Gian, Suneo and even Doraemon want to run away from their homes. Then Nobita suggests that they should go back in time to live in a place with very few humans. The group agreed with him and thus, they return to the past Japan, which is 70000 years back from then. When they reach the Japan, Doraemon assigns everyone a ministry. Shizuka is given the ministry of gardening, Gian got ministry of development, Suneo received the ministry of landscape and Nobita received ministry of animals. Doraemon looks after all the ministries. Nobita, who is given the ministry, mixes the genes of different animal and created Pegasus, Dragon and Griffin. When Doraemon comes, he hides them from him. At night, the group eats the supper and decides to return home and visit here another day. On the next day, the boy from the start of movie secretly moves into the Nobita's room and hides behind the door. When Gian and Suneo come, Gian fights with him and due to weakness the boy faints. 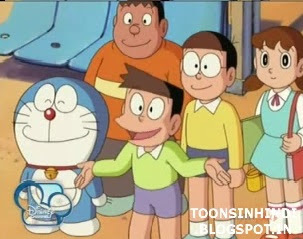 On the arrival of Nobita, Shizuka and Doraemon, the group again moves to past. They take the boy into the cave and when he regains conscious, Shizuka gives him food. Doraemon use translation tool in order to understand him. He tells them that he belong to the light tribe and they got attacked by dark tribe which took all of his people. So Nobita and Doraemon decide to help him. They trace the dark tribe on Pegasus, Dragon and Griffin for four days. On the fourth day, they found them and fight with them. However their shaman proved to be strong and give them a strong challenge only to be defeated by Doraemon's gadget. Unknown to them the shaman possess the power to restore. They took the whole tribe to Japan to give them a peaceful place to live. At night they return home. Next day Doraemon tells every body that shaman can restore it self and light tribe is still in danger, so the again move to prehistoric time. They reached late and Dark tribe had already taken the light tribe. They again traced the dark tribe with Doraemon's human train gadget, but Nobita gets lost and separates from the group in the strong ice-fall. Except for Nobita, the rest of group continues to move and they find the light tribe. Doraemon fights with Gigazombie who was the king of spirits. Doraemon reveals him to be the time criminal, who is creating his own world. He easily defeats Doraemon and others. On the other hand, Nobita finds out a box near him and sees a hologram that tell him that if needs help he just have to press the button. Nobita's pet animals Pegasus, Dragon and Griffin return and they rescue his friend. However Gigazombie shuts them to a lone place. Nobita uses button and the helper revealed to be Time Patrol who captures the Gigazombie. At the end Pegasus, Dragon and Griffin were returned to Time Patrol as they could not survive in modern era. The groups leaves for home. How to view:Download all the files by clicking on the top-right corner of each file then clicking download button on the top. For furthur details see ReadeMeFirst file in this link http://1drv.ms/1g02bhh.